In March 2018 I decided to start swimming as an alternative to running and to take a break. My first venture to the pool was approximately a 1km swim with me exiting the water feeling quite dizzy and unbalanced as I walked in a diagonal line to the change rooms. My breath was laboured, and my head lopsided, I wondered why I was so bad at swimming. I could run up to 170km continuously for 28 hrs but couldn’t swim for 30 mins. After consulting my oracle (my wife 😊) , she informed me about Masters Swimming and how they could help me. After a quick search of the interwebs, I found a swim club that I thought would suit me. I went down to Claremont Masters, fondly called the Gropers (I didn’t realise that was a fish ☹). After getting some great advice and meeting a soon to be coach and mentor (Elena Nesci) I was starting to make improvements in my ability to swim. 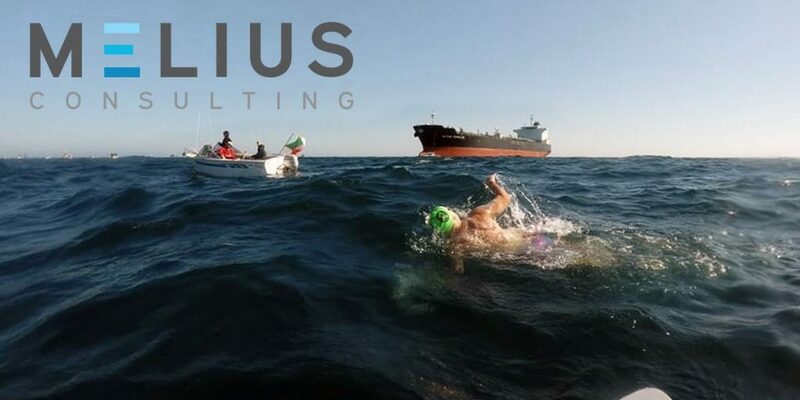 I set a goal for the 1st year; it was to be able to swim 2.5km in the pool without feeling hypoxic or dizzy and maybe have a crack at a few 2.5km ocean swims over the summer in Perth as part of the Open Water Series (OWS). As my swimming skills advanced and my distance increased, so did my goals. After attending some private lessons with Elena Nesci at E-Swim and partaking in the Monday and Thursday swim sessions, I was starting to see an opportunity to change my goals and push myself past the initial goal of 2.5km. 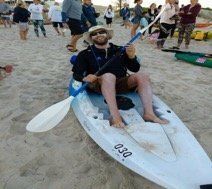 I joined the Rottnest E-Swim squad to partake in training to help improve my swimming, and if the chance arose to be part of a 4-person team to do the crossing to Rottnest in the Rottnest Channel Swim (RCS), I would take it. 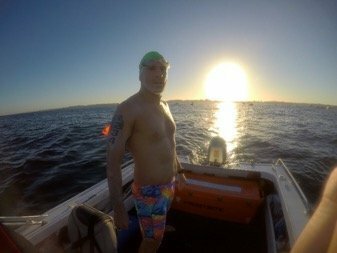 In December 2018 I swam the longest I ever have in open water, completing 3.3km. In January I completed a 5km swim, and I attempted a 10km swim at Sorrento but ended up dropping out after 8km. Finally, I finished a hybrid session of 5.5km in the swimming pool followed by 3km in the ocean at the Cottesloe classic mile during a Saturday morning. At this stage, my confidence and my ability had dramatically improved. I decided to enter a duo team with my Lane 4 partner Laura Maclean in January for the Port to Pub swim. Port to Pub is a race from Leighton beach outside Fremantle to Rottnest Island (19.7km) approximately three weeks after the RCS. We entered as a corporate team under my business “Melius Consulting” Health, Safety, Improvement. My training continued, and I felt good, although there were some minor issues with my lower back which resulted in some alterations to my training regime. Enough pre-event guff!!! The weather during the week of the Port to Pub was looking pretty crap, but our trusty skipper Blair was keen for us to attempt the crossing as he would make an early call to abandon for safety if needed, which I fully supported. I arose on Saturday morning at 03:30 to get ready for the duo crossing. After 4-5 hours’ sleep, I was bleary-eyed but keen to go. Blair and another paddler Matt picked me up (Matt, Blair and I used to run 100km mountain ultra-marathons), and we headed to the south end of the Swan River somewhere near Point Walter to launch the boat into the darkness. 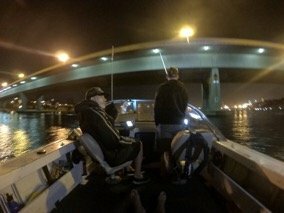 We steadily headed down the river toward Fremantle under the Stirling bridge to exit into the Indian Ocean before heading north towards Leighton beach where we would hold 1km or so offshore to meet our swimmer Laura who would be starting from the beach. At 06:40 Laura departed Leighton beach, and we headed towards the meetup point about 1km or so off Leighton where we met Bruce Armstrong our second paddler who was paddling around looking for Laura. After a few minutes, he found her, and we meandered through the other boats to get clear so we could do the firsts changeover. Bruce is practising his stroke on dry land before heading out. With my colourful trunks, goggles and hat I entered the water and high fived Laura and continued towards Rottnest. From now on the swimmer follows the paddler and the paddler follows the Skipper on the boat who is responsible for our overall safety and getting us there in a straight line (Following a Rum Line). After twenty minutes it was time to change over and for Laura to get back in again. Our strategy was 20 mins on/ 20 mins off. I headed back to the boat to hydrate and rest before my turn. At this stage everything was going well, the sea was choppy, and the water was a bit cooler, but we were making good ground (Or Water !!) and we were feeling good. I ended up swimming straight into a flock of Jellyfish (What is a group of Jellyfish? School?) and I got stung all down my right-hand side, a few F- words and I was off again in the right direction. We passed the 5km mark, and all was well, however, it was getting rougher and rougher by the minute. Although I was getting a little queasy, I was still feeling okay. Then somewhere around the 8 or 9 km mark, it was my turn to swim. Now the sea was rocking me in every direction. Waves broke on my back, and I was swallowing water and had to be strategic about when I took a breath. I mainly turned to the right to protect myself from the south westerly swell so I could take a breath. 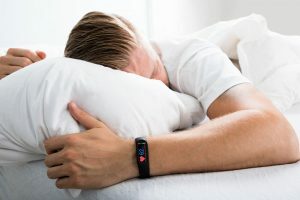 My stomach churned, and my head got light, and then I turned to my side and did two bouts of projectile vomit as I wretched from the depths of my guts. I continued feeling like crap but determined to go. I changed over with Laura and tried to rehydrate as much as possible. I struggled on and managed to do a few more changeovers, each time seeming harder than the last, and now I was getting colder. Around 14km I entered the boat and hung over the side and did the biggest vomit of my life, with 7-10 discharges nothing was left, and nothing was staying down. At this stage, I was quiet which is unlike me 😊. With less than 6km to go my goal was to sip water and remain warm. Bruce informed me due to the geographical features of Rottnest Island that from 18km, Phillip Rock protected the bay and the water would be more comfortable to swim in. My goal was to get to the 18km mark. Bruce was right, as we got closer to the island the swell and wind dissipated, and I started to feel better. I began to perk up and instantly felt good. At about 18.5km or so I changed over with Laura for the last time. I would now have to swim 1.2km or so continuously to the finish. I thanked Blair as I wouldn’t see again that day and jumped off the boat for the last time that day. 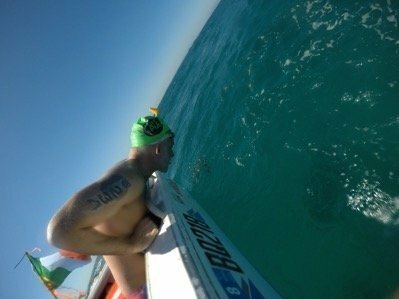 The water was becoming calmer with every stroke, and the swell was nearly gone as we entered the sheltered Thomson bay. At the 19km mark, Laura joined me in the water to complete the last 700m. Blair peeled off with the boat and dropped Matt and all our gear on the jetty as he wanted to get back to Fremantle before the wind and swell got too bad. We continued with Bruce, and he peeled off with about 300m to go to put the kayak on the beach. Laura and I swam through the warmer waters over the seagrass to eventually see sand. We swam 4-6 more strokes, and we could stand up…. we were on LAND, and we had finished the Port to Pub 19.7km swim as a duo. We walked through the gate and received our medal, hat and towel. I can’t describe how good that felt. In the 17 years, I have lived in Western Australia, I have never been to Rottnest Island. My first time was to swim there. There is something weird and special swimming out into the ocean to an island. We headed to the swimmer recovery area to rehydrate and rest up on the island for a couple of hours. I managed to get some food into me and numerous sources of hydration (Milo, lemonade and water) and we even had a sports massage. At 17:30 we boarded the Rottnest Express ferry and were back on the mainland in 30 mins versus the 8 hrs 21mins it took us to get there. So less than 24 hrs after doing this event, will I do it again? Will I do a solo? For those who know me, you probably know the answer already 😊, for now, I am sitting back for a few weeks to think about options. And finally, to my wife Kathryn who puts up with all my crazy events and who always supports me in my endeavours.